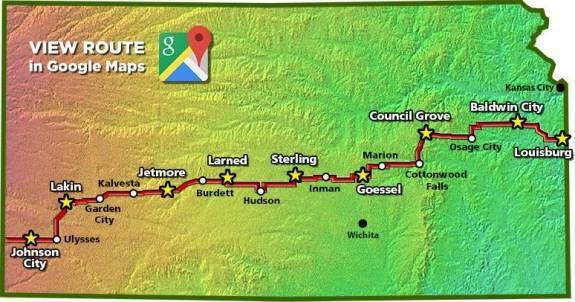 Biking Across Kansas, the annual week-long supported tour across the Sunflower State, has announced their 2015 route, which crosses the central tier of the state, for a total of about 502 miles, June 6-13, 2015. The tour leaves Johnson City, near the Colorado border, on Saturday, June 6th, and arrives in Louisburg, near the Missouri state line, on June 13th. The route covers about 502 miles, with overnights in Lakin, Jetmore, Larned, Sterling, Goessel, Council Grove, and Baldwin City.